You may find with Gaia GPS that your recorded tracks are not the same length as the track lengths displayed on other iPhones, Androids, GPS devices, maps or trail markers. Even the most recent models of iPhones and Androids, which have better GPS chips, can easily vary by 5-30% from other readings. Despite the fact that Gaia GPS is calibrated to poll the GPS for maximum resolution and accuracy, the following factors confound estimation. We continue to explore ways to improve estimation of distance from GPS data but there are limitations that will always exist. 1. Trail Markers and Maps are Measured in Multiple Ways - Trail markers and maps use multiple methods to determine the length of trails. 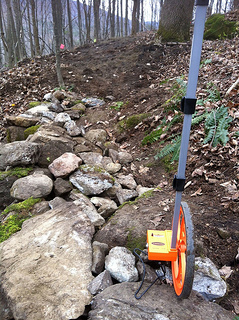 The most accurate measurements are done with a measuring wheel, which is rolled along the trail and has a revolution counter. Even with a wheel there is plenty of opportunity for error. The wheeler must be careful that the wheel does not slip, and wheelers have to decide which parts of trails to measure when there are difficult scrambling sections or two ways around a tree in the middle of a trail. 2. Your Device's GPS Accuracy - GPS accuracy varies across iOS and Android devices, the newer the device the better the estimation. If you use a newer device, you will likely have a more accurate reading than a friend that uses an older one. Additionally, thick tree cover and cloud cover, or even tall buildings, can interfere with your device's connection to GPS satellites. 3. Inaccuracies Accumulate Over Time - When a computer, like an iPhone, Garmin, or Android records GPS locations, each location or track point, has a small amount of possible error. These marginal errors add up over time, so your tracks are likely to be recorded as longer than you expect.